Algeria's 'Black Decade' Still Weighs Heavily Much like its neighbors, Algeria faces high unemployment, corruption and poverty. However, a bloody and brutal civil war during the 1990s has left Algerians hesitant to take to the streets and call for change. They say they're tired of upheaval and violence. 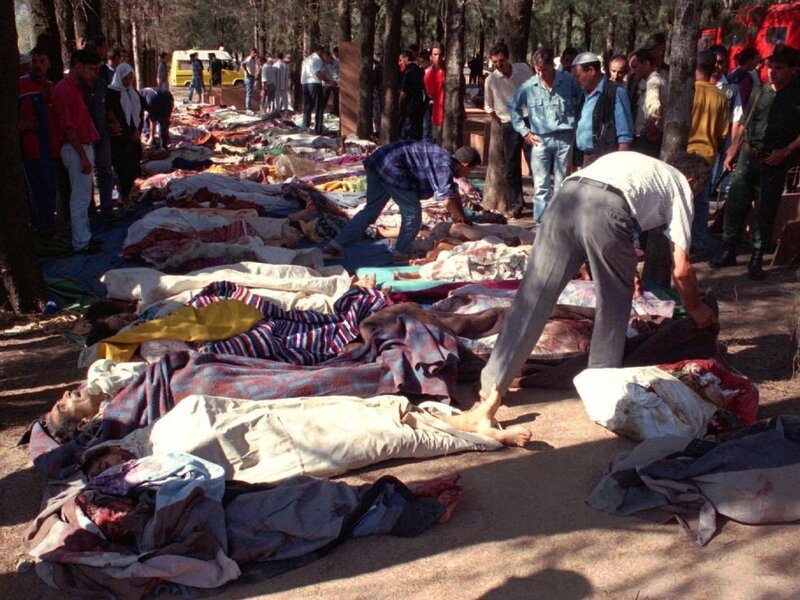 People try to identify relatives after a massacre at Rais in the Sidi Moussa region of Algeria on Aug. 29, 1997. Islamist radicals killed more than a dozen Algerian soldiers last week in a rare flare-up of violence between Muslim extremists and the Algerian state. During the 1990s the government fought a brutal civil war against an Islamist insurgency that it eventually won. But at an enormous cost: the death of some 200,000 civilians. Algerians say it's the memory of those years of violence and upheaval that has kept people from demonstrating in the streets against their government; even if they face some of the same problems as other Arab nations. "The Black Decade" stills haunt Algerians today. The French submission to the Oscars in March was a film about seven Trappist monks killed by Islamist extremists at their monastery in the mountains of northern Algeria. The movie, Of Gods and Men, is based on a true story from 1996 as the Algerian state battled an Islamist insurgency. The movie shows the monks living in friendship with the poor, local population, offering health services and joining in weddings and celebrations. As the country slips deeper into conflict, the monks don't know whether to stay and risk death, or leave and betray the local population that depends on them. They choose to stay and are eventually kidnapped and beheaded. Although the murders of the monks shocked the West, Algerians were suffering similar tragedies every day, says Algerian journalist Rachid Khiari. "People lived for eight years not knowing if they would even return home when they left the house in the morning," he says. "People saw babies massacred and whole village wiped out. Today there are cases of schizophrenia relating to those years. It was horrible, and after a while, no one knew who was killing who anymore." The civil war began after an era of unprecedented openness in the late 1980s. Personal freedoms blossomed and dozens of new political parties were created. But when Islamist parties appeared ready to sweep to victory in the early 90s, the government canceled legislative elections. People lived for eight years not knowing if they would even return home when they left the house in the morning. People saw babies massacred and whole village wiped out. Today there are cases of schizophrenia relating to those years. It was horrible, and after a while, no one knew who was killing who anymore. The Islamists fought back, initially targeted the army and police — but then they began attacking civilians; artists, teachers, judges and journalists were slain. State security forces, trying to root out the insurgency, often killed indiscriminately. By the end of the 1990s, an estimated 200,000 Algerians had died. Members of the Algerian Association of the Disappeared have been protesting once a week since 1998. They say they simply want information about the more than 8,000 Algerians who went missing during the Black Decade. Nassera Dutour, who is president of the association, says she doesn't bother wearing makeup since her son Amin was kidnapped some 13 years ago. She calls her frequent laugh a nervous habit. "The military and police would come together," she says, describing how people like her son disappeared in the 1990s. "They'd circle a village looking for so-called 'terrorists.' It was like the gestapo. They'd knock at the door, lock up the women and take the men. And if they couldn't find who they were looking for, they'd take other family members." The government eventually put down the insurgency. In 2005, under Algerian President Abdelaziz Bouteflika, Algerians approved a charter for national reconciliation. It gave amnesty to Islamists who handed in their weapons, and families were monetarily compensated for members who had disappeared. Dutour says she and the other mothers also want information about their children, but since the amnesty, the government considers the issue of the missing closed and refuses to meet with them. Almost every Algerian was touched by the killings of the 1990s. Dr. Amel Abbas is seeing patients at one of the main hospitals in the capital of Algiers. She says the violence of the 1990s still profoundly affects Algerians. During the Black Decade, people just tried to stay alive and prayed that the killing would stop. That's why they don't take to the streets in protest now. "People want to live peacefully and normally now," she says. "And we want to become more prosperous, too. I think once we've done that, we'll think more about democracy." Abbas and other Algerians say they want change to come, but they want to take their time and make sure it comes peacefully.